Is there anyone that Meryl Streep can’t play? Let’s take stock: Julia Child (Julie & Julia), Karen Silkwood (Silkwood), Susan Orlean (Adaptation), Karen Blixon (Out of Africa) and Anna Wintour (well, if you believe Miranda Priestly in The Devil Wears Prada was based on Wintour). Now the queen of stage and screen is playing former British Prime Minister Margaret Thatcher, a woman who smashed through gender and class barriers to rise to the top in a male-dominated world. 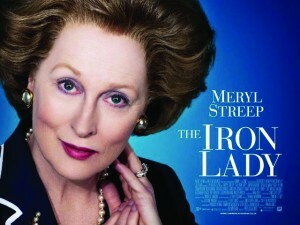 The film follows Thatcher from her early years to her reign as prime minister to her political downfall in 1990. With Streep onboard, this film is a great history lesson about a complex and powerful woman. Directed by Phyllida Lloyd (who also directed Streep in Mamma Mia! ), this movie also stars Jim Broadbent as Thatcher’s husband Denis and Richard E Grant and Anthony Head as cabinet ministers Geoffrey Howe and Michael Heseltine.